A portrait of the Bangladeshi community in London, Brick Lane follows Nazneen, a young girl from a village in Bangladesh who is married off to Chanu, an older Bangladeshi man, and moves with him to the UK. During her early years in London, Nazneen’s world is confined to her apartment, crammed with furniture and knick-knacks. She speak no English, and her human contact is, for the most part, restricted to the tattoo lady in the apartment opposite, who sits at the window smoking and drinking beer and barely notices Nazneen as she waves to her. Slowly, Nazneen’s world expands, and she gets to know some of the Bangladeshi women who live nearby—Razia, with a strong sense of fun and a great mimic, whom Chanu dismisses as “not respectable”, and Mrs. Islam, bossy and intefering, whom he holds in high esteem. Nazneen settles into her new life, starts working as a seamstress, and they have two children. The story picks up pace when Nazneen meets Karim, a young radical, who brings her sewing work, and starts a passionate affair with him. The story is told in third person from Nazneen’s perspective, and reflects her understanding of the world around her. The characters are well drawn and grow over the course of the book as they reveal themselves to Nazneen, a perceptive observer. Chanu is a kind-hearted man with dreams that he cannot realize, not because the dreams are too big but because he is more talk than action. Their flat is filled with his certificates, many of them worthless. Although he is pompous and has a tendency to hold forth, he is aware of his shortcomings. The relationship between him and Nazneen is tenderly described as they develop a closeness over the years. 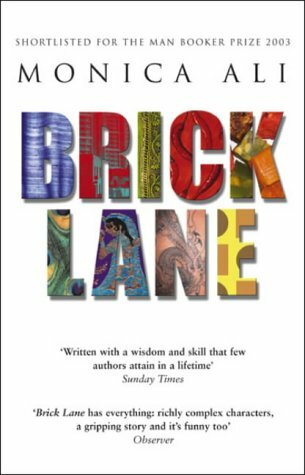 Brick Lane is a book about the immigrant experience. It is something that fails Chanu, and he decides to take his dreams back to Bangladesh. Karim, who has spent all his life in London, rediscovers his religion and tries to organize the young people of the community into the Bengal Tigers, partly to take on racists—an experiment that doesn’t really work either. The women in the book—Nazneen, Razia and Mrs. Islam—are stronger and more successful, each in her own way carving out her path. However, there is one weakness, and I think it really detracts from the book. This is the parallel story of Nazneen’s beautiful sister, Hasina, in Bangladesh. Just before Nazneen leaves, Hasina elopes with the nephew of the sawmill owner, who turns out to be a bully. (Why do fictional women who elope always end badly?) She leaves him, becomes a garment worker, is thrown out on trumped-up charges and becomes a prostitute. All this is told in her badly written letters to her sister. It’s as if Ali felt that a book about Bangladeshis needs to tackle garment workers, prostitutes and acid attacks. The letters are too brief to do the any of these issues justice. Unlike those in London, the characters do not come alive, not even Hasina. The book could have been shorter and would have been better for it. But that apart—and this was Ali’s first novel—I did enjoy the writing and the characters. They felt real and like people I might know.